Andrew Milton Hinshaw2,8,9,10,11,12 [Milton Hinshaw3,7,13]. Hinshaw, Milton, head-of-household, age 32, born in Kansas; parents born in Illinois; married 5 years; farmer; owns farm. Hinshaw, Eugenia, wife, age 33, born in Idaho; father born in France; mother born in Canada; married 5 years; 3 children, 3 living. Hinshaw, Cleatis, son, age 5, born in Idaho; father born in Kansas; mother born in Idaho. Hinshaw, Addie, daughter, age 3, born in Idaho; father born in Kansas; mother born in Idaho. Hinshaw, Zora, daughter, age 10 months, born in Idaho; father born in Kansas; mother born in Idaho. Hinshaw, Andrew M, head-of-household, age 42, born in Kansas; father born in Iowa; mother born in Indiana; owned home; farmer. Hinshaw, Eugenia, wife, age 42, born in Idaho; father born in France; mother born in Canada. Hinshaw, Cleatis G, son, age [smudged], born in Idaho; father born in Kansas; mother born in Idaho; attended school; farm laborer. Hinshaw, Addie I, daughter, age 13, born in Idaho; father born in Kansas; mother born in Idaho; attended school. Hinshaw, Zora N, daughter, age 10, born in Idaho; father born in Kansas; mother born in Idaho; attended school. Hinshaw, Iris L, son, age 9, born in Idaho; father born in Kansas; mother born in Idaho; attended school. Hinshaw, Eldora E, daughter, age 6, born in Idaho; father born in Kansas; mother born in Idaho; attended school. Hinshaw, Elena, daughter, age 4, born in Idaho; father born in Kansas; mother born in Idaho. 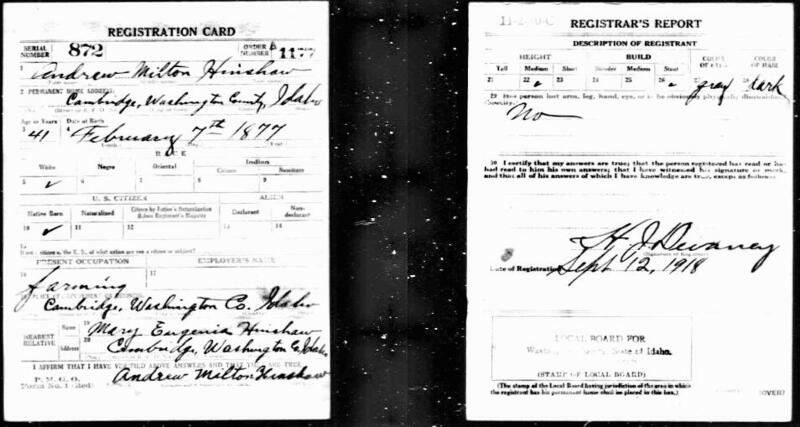 Hinshaw, Milton, head-of-household, age 53, born in Kansas; father born in Iowa; mother born in Indiana; first married at age 27; owned home ($600 value); no radio in home; occupation: farmer; not a veteran. Hinshaw, Eugenia, wife, age 54, born in Idaho; father born in France; mother born in Canada (French); first married at age 28. Hinshaw, Addie, daughter, age 23, born in Idaho; father born in Kansas; mother born in Idaho; occupation: worker, fruit [..unclear..]. Hinshaw, Iris, son, age 19, born in Idaho; father born in Kansas; mother born in Idaho; occupation: laborer, farm. Hinshaw, Elena, daughter, age 14, born in Idaho; father born in Kansas; mother born in Idaho; attended school. 1910 census index, Washington County, Idaho. 1910 census, Cambridge, Washington County, Idaho; ED 273, page 164 (sheet 5B), line #51, dwelling #83, family #83. RootsWeb WorldConnect data by Janet Alford (). Idaho, Birth Index, 1861-1912, Stillbirth Index, 1905-1962; http://www.ancestry.com. 1920 census, Cambridge, Washington County, Idaho; roll T625-294, ED 182, page 8B, line #73, dwelling #163, family #166. 1930 census, Weiser Forest, Cambridge Precinct, Washington County, Idaho; roll T626-404, ED 18, page 1B, line #58, dwelling #19, family #19. 1880 census, Mill Creek Township, Pottawatomie County, Kansas; roll T9-393, ED 239, page 218C, line #37, dwelling #210, family #224. 1900 census, Salubria Precinct, Washington County, Idaho; roll T623-234, ED 110, page 5A, line #32, dwelling #76, family #77. Ancestry Family Tree data "Kyler/Bonds/Haworth" posted by "judyr1918". Obituary of Nancy Jane Godlove. Idaho Death Index, 1911-15; http://www.ancestry.com. 1920 census, Cambridge, Washington County, Idaho; roll T625-294, ED 182, page 8B, line #51, dwelling #158, family #161.